Tools may not make the craftsperson, but they do make his life a heck of a lot easier. And with enterprise training, easy is important. So, why not go the easiest route and create your eLearning portal in 30 seconds? Just like that! Ready To Start Your Free eLearning Portal? This post is for you, the businesses that have been looking to start their own corporate training program but have been held back by a concern about not having the IT resources or expertise required. Or perhaps you fear that deploying a Learning Management System (LMS) is an elaborate and/or expensive venture that will disrupt your business and take months to complete. If so, you've chanced upon the right article. Because we're going to show you how you can create your own corporate eLearning portal in half a minute or so. With a modern Cloud-based platform like TalentLMS, it very much is. Cloud computing is just a fancy word for "software and services running on the internet". You know, like Gmail, Facebook, Google Docs and such. 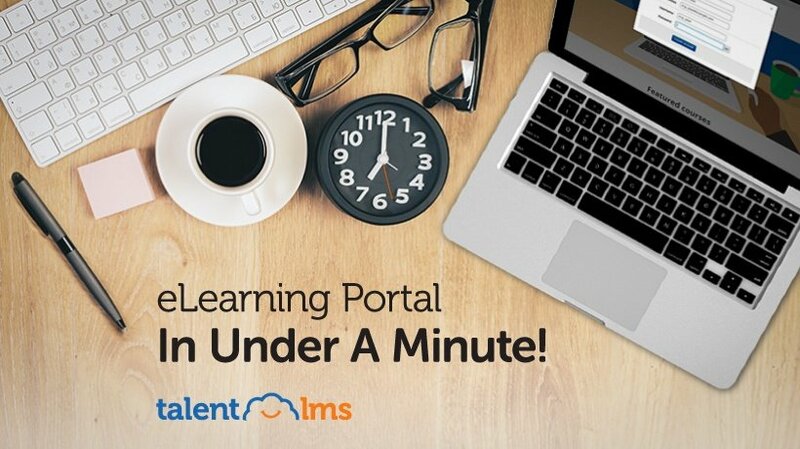 If you are familiar with those kinds of Cloud apps, then you already know how to create your own TalentLMS-based eLearning portal ― and it really just takes half a minute or so. Basically, all you need to do is visit the new account page, fill in your name and email, and pick a password and a name for your training portal, and that's it. By simply filling in this form, TalentLMS will automatically create your own fast, powerful, and fully customizable eLearning portal. Since TalentLMS runs on the Cloud, there's nothing to download or install, and it requires no technical expertise to deploy and maintain. You can literally start working as soon as you've created your TalentLMS account. Of course you'll need to put in some work yourself. For one, you'll need to create accounts for your learners (if you are a corporation, those would be the employees you want to train), and to create or import your own custom eLearning material. Thankfully, TalentLMS' intuitive interface makes both of those tasks (and many others) pieces of cake. Heck, you might even be able to skip creating your own content, as TalentLMS comes with its own embedded content marketplace where you can buy and deploy professionally-made courses covering all kinds of enterprise-y subjects. Or you could simply import any industry-standard SCORM compatible training content (which you can get from online marketplaces or create yourself using popular authoring tools like Articulate Storyline). Note that, while its renowned for its ease of use, TalentLMS also comes with all kinds of advanced features you'd expect from an eLearning platform targeting the enterprise. These include all kinds of integrations (from Single Sign On and SCORM, to WordPress, Shopify and more; including several thousand Zapier-powered integrations), a comprehensive Reporting toolset, and a full featured Gamification engine. Oh, and if you plan to grow your business, TalentLMS supports unlimited users too. We truly believe that there's no faster or more convenient way to check the "deploy our own corporate training portal" off from your TO DO list. If you have 30 seconds to spare (and you probably do, if you've got this far in the article), you are welcome to create a FREE account and check TalentLMS out for yourself.